I have an L1 compact. Good for vocals but as yet I don't trust it for guitar (but I'd like to be able to leave my guitar amp at home sometimes!) I use semi-acoustic archtops with single floating humbucker pick-ups (Peerless Virtuoso and others). I want a clean, old-school jazzy sound -- as true to the natural instrument as possible. Which of the guitar pre-sets does anyone recommend for this? I assume the idea is that you find a guitar pre-set that matches your instrument -- but I can't see anything appropriate. The ones I've tried sound too "processed" to my ears. Maybe just stick to "utility" set flat? You don't say it, but I am assuming you have one of the Bose T mixers. I would set up the mixer and just go through the guitar presets one by one. Set all controls flat, and add no effects. When you hear one that sounds promising, make a note and move on. there might be two, three or more that you like. Go back to them and tweak the eq a little and see what you come up with. I have found that in most all cases I prefer the Taylor presets regardless of what guitar or pickup I am using, but, when I use the Compact I go straight in and am happy with the built in preset. We use different type of pickups, no magnetics on my guitars, and that is a difference, but, .............. the method for finding what you like is the same, experiment with all that is available. I use this Preset with my jazz boxes. This is the same as Utility/Flat except it sets the zEQ centers for Low, Mid, High to useful values for electric guitar. Here's another one to try. This sounds like you're running clean through a 12 loudspeaker in a guitar cabinet. 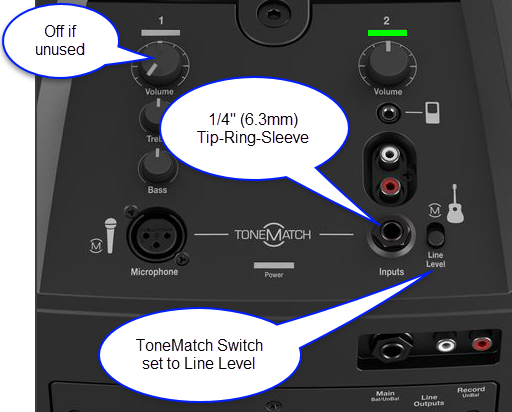 When you connect the ToneMatch mixer to the L1 Compact, set the ToneMatch switch to Line Level. Please let us know what presets you like best after you've had some more time to explore. Thanks, very helpful. Just tried both settings and they sound OK. I guess my point was that there numerous brand name presets to choose from but none specifically for jazz boxes.But, yes, these general settings do the trick.